Whereas myeloma involves the whole bone marrow, monoclonal IgG or IgA can also be due to a localized malignant plasma cell clone. These solitary plasmacytomas can be located in bone or extraosseous tissue, often in the head or neck. Its solitary nature is established through a series of tests, including at least a bone marrow differential count and MRI of the spine. Solitary plasmacytomas occur infrequently but it is important to recognize them because they can only be treated locally, predominantly by radiotherapy. After treatment, disappearance of the monoclonal Ig is a necessary (but not sufficient) condition for cure to be achieved. Solitary plasmacytoma can progress to myeloma or, more commonly, additional « solitary » plasmacytomas can develop at different sites. The acronym POEMS denotes a syndrome characterized by plasma cell proliferation, usually in the form of a solitary plasmacytoma, and peripheral neuropathy (P for polyneuropathy). The plasmacytoma or plasmacytomas have two distinctive features: they secrete monoclonal Ig (M for « monoclonal component ») of either the IgG or often the IgA class, almost always with lambda light chains, and are accompanied by bone lesions that are at least partially osteosclerotic rather than osteolytic. The syndrome may include other manifestations, such as organomegaly (O), various endocrine signs (E for endocrinopathy) and cutaneous signs (S for skin changes). Remarkably, all of these symptoms can resolve on effective treatment of the plasma cell clone, for example by irradiation of a single localized lesion. Conversely, relapse of the plasma cell disorder leads to re-emergence of the associated signs, and the neuropathy in particular. These phenomena suggest that the abnormal plasma cells secrete a factor or a combination of factors that act on the various target organs. 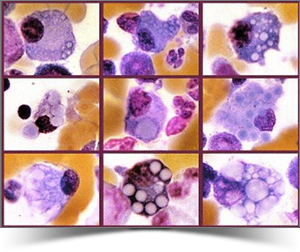 While the vast majority of monoclonal Igs are normal in structure, some are abnormal, the prime example being the heavy chain diseases (HCDs). HCD is characterized by the presence in serum of a monoclonal Ig composed of two incomplete, truncated heavy chains, with no associated light chains. The most common of these diseases is alpha HCD. Patients with alpha HCD very often present with chronic diarrhoea with malabsorption syndrome. The lesions progress from an initial stage characterized by diffuse lymphoplasmacytic infiltration of the small intestine and mesenteric lymph nodes, to a neoplastic stage marked by the presence of malignant, usually immunoblastic, lymphoma. Its epidemiology is remarkable: it occurs in young people, usually aged between 10 and 30 years, from socioeconomically disadvantaged regions with poor sanitary conditions. Another remarkable observation is that complete remission can be obtained at the initial stage, including disappearance of the abnormal protein from serum and jejunal fluid, simply by administering antibiotics. Alpha HCD is therefore a pathophysiological model for haematological lymphoid disorders in which repeated antigenic stimulation (intestinal infections) is linked to proliferation of a lymphoid population secreting abnormal Ig, which is initially non-malignant but capable of transformation into aggressive lymphoma.